While in nearby Mourmelon, the 6ème Brigade Légère Blindée (6th Light Armoured Brigade) carried out its validation exercise as a digitized brigade, the second brigade of the Armée de Terre to reach this step. In parallel, at nearby Suippes, a joint military-industrial team was testing future digitization elements and weapon systems, both in real life and virtually, in order to establish the way forward for the French Army. Phoenix 2007, carried out by a team including Délégation Générale pour l’Armement (DGA), Section Tecnique de l’Armée de Terre (STAT) officials and Sagem Sécurité Défense engineers was mainly focused at platoon level: the main topic was to verify how much the imagery provided to the platoon commander could be useful, the imagery being provided by numerous sensors ranging from the FELIN future soldier system to an MBDA Milan ADT-ER firing post. According to those involved in Phoenix 2007, results showed that at platoon level the commander would be overwhelmed by the sheer volume of this information. Consequently, Phoenix 2008 shifted its focus to higher command echelons, incorporating the company level or what is referred to by the French Army as Sous-Groupement Tactique InterArmes (SGTIA), which is the task group at company level. Industrial participation was extended to numerous other companies besides Sagem, which maintained a coordination role, including Bohemia Interactive, EADS Defense & Security, Nexter Systems, and Thales, while Panhard and Renault Trucks Défense provided vehicles integrated with C2 and recce equipment. The field deployment, which incorporated strong computer assistance in order to simulate systems which are still on the drawing board, followed an extensive preparation at the DGA’s Laboratoire Technico-Opérationnel (LTO), the technical-operational laboratory at Arcueil, south of Paris. This enabled scenario planning for the modelling and the test methodology, which included advanced systems such as the MEEFISTO tool to track and record all messages – voice and data – exchanged by the actors in the field. Ergonomics experts were attached to operational elements for the whole duration of the exercise, and all actions were recorded by TV cameras. The main topic was to verify a new organisation at the company level command post, in order to allow the captain to handle all the information as well as beyond line-of-sight (BLOS) weapon systems. Named Tir Au delà de la Vue Directe (TAVD), this concept is currently being worked out in the French Army but according to personnel taking part in Phoenix 2008 this should be an extension of the direct fire support that the SGTIA commander will be able to be to carry out with his own weapon systems, without requesting support from higher echelons. The systems that in the future will allow him to do so include the Nexter Polynege munition, which can be fired by any 120mm tank gun such as that of the Leclerc, and the MBDA Missile de Combat Terrestre/Multi-Role Combat Missile (MCT/MRCM) which is planned to be integrated aboard the future Engin Blindé à Roues de Combat (EBRC). The Cellule de Conduite de la Manoeuvre (CCM), manoeuvre control cell, was created to co-ordinate these capabilities. Headed by the company deputy-commander; the CCM was equipped with software tools that support the officer in the planning process. 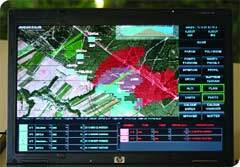 These included Sagem’s ORTAC (Optimisation du Réseau Tactique des Acteurs au Contact), working on the SITEL network, which among other functions, predicts the movement timing of blue and enemy forces and Nexter’s OCAD (Outil Cartographique d'Aide à la Décision) 3-D terrain analysis tool. The CCM received intelligence elements from another newly formed cell which was tested during Phoenix 2008, named Cellule de Surveillance Spécialisée (CSS) or special surveillance cell. Located in a Sherpa 3 vehicle, the CSS received a variety of information from the many sensors deployed on the field. Among the sensor systems exploited by the CSS these were EADS Drone de Reconnaissance Au Contact (DRAC), two observation vehicles in the form of Panhard PVPs equipped with the Weapon under Armour for Self Protection (WASP) turret developed by Panhard and Sagem and first shown at last Eurosatory, a Milan ADT-ER firing post, optronic sensors distributed at the lower levels such as Sagem’s Sophie and Jim LR thermal sights, as well as Fantassin à Équipements et Liaisons INtégrés (FELIN) rifle sights. 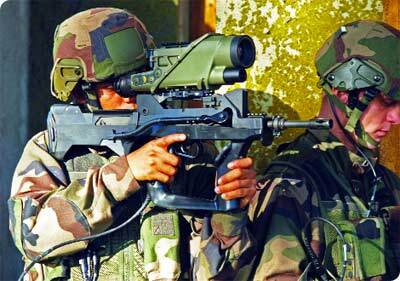 Developed by Sagem, two sights are available, one for the FAMAS assault rifle and one for the FR.F2 sniper rifle. The former utlilises a light intensification channel with two Fields Of View (FOV), 7° and 3.5°, a thermal uncooled channel (7.8° and 3.9° FOV), a CCD daytime channel (7.2° and 2.4° FOV), and the images acquired can also be seen “around the corner” either on the helmet-mounted monocular known as Oculaire de Vision Déportée (OVD) or on a handheld screen. However the picture can also be relayed to higher echelons through the Radio Individuelle du Fantassin (RIF), the soldier’s personal UHF digital data/voice radio which operates at distances of up to 1,000m in open areas and 300m in urban areas. As for the sniper, his rifle is equipped with a sight with a thermal channel (4.1° and 2.05° FOV), day channel with direct optical path (2.7° FOV) and a Class 1 laser rangefinder operating up to 1,500m. According to officers involved in the experiment, the cells’ organisation will have to be reviewed. The current option seems to be a merging of the CCM and CSS in the Cellule d’Aide à la Manoeuvre (CAM), a manoeuvre support cell, headed by a lieutenant/captain and including an intelligence specialist; this will help in reducing the intelligence cycle for information coming from short-range sensors, allowing a direct contact between the CAM officer and the intelligence specialist, while the SGTIA commander and his deputy will operate together, also in order to ensure proper rest for both of them. BLOS communications were supported by MBDA’s Module d’Aide à la Gestion des Engagements (MAGE), a module supporting engagements, which allows the optimisation of the sensor-to-shooter cycle, reducing as much as possible the laser target designation period. The Thales Comm@nder Fires C2 system, developed from ATILA, allowed the CCM to call in indirect fire from its organic elements without having to request it through higher echelons.